(CBS News) First-term Republican Gov. Scott Walker has survived the Wisconsin recall election, beating back a labor-backed effort to unseat him and again handing defeat to his Democratic challenger, 58-year-old Milwaukee Mayor Tom Barrett. With 94 percent of the expected vote in, Walker led Barrett 54 percent to 45 percent. Barrett conceded the race late Tuesday night, saying that while "the state remains divided," he hopes all sides will remain engaged to serve the interests of Wisconsin families. The 44-year-old Walker -- the first governor in U.S. history to survive a recall election -- thanked cheering supporters late Tuesday. "Tonight we tell Wisconsin, we tell our country, and we tell people all across the globe that voters really do want leaders who stand up and make the tough decisions," he said, adding, "the election is over, it's time to move Wisconsin forward." Walker said that while "bringing our state together will take some time, no doubt about it," he believes "there is more that unites us than divides us." The Wisconsin governor said he planed to hold a meeting with the entire state legislature next week. The recall fight, prompted by Walker's decision to strip Wisconsin public workers of their collective bargaining rights, has doubled as a proxy fight over whether Republicans can push through spending cuts and confront organized labor - and live to tell about it. "Governor Walker has demonstrated over the past year what sound fiscal policies can do to turn an economy around, and I believe that in November voters across the country will demonstrate that they want the same in Washington, D.C.," presumptive Republican presidential nominee Mitt Romney said. "Tonight's results will echo beyond the borders of Wisconsin." The Romney campaign said the former Massachusetts governor called Walker to congratulate him Tuesday evening. Can Romney capitalize on Scott Walker's win? According to the Center for Public Integrity, candidates and outside groups spent in excess of $63 million on the recall election - an enormous figure that easily breaks the previous record of $37.4 million (set in the 2010 gubernatorial contest) for spending in a Wisconsin election. According to the New York Times, Walker and his Republican allies spent $45.6 million on the race as of May 21, while Barrett and his allies have spent $17.9 million. Turnout had been expected to exceed the 2010 election total, with an estimated 2.8 million people expected to cast ballots. Reports emerged from Wisconsin Tuesday of robocalls informing voters, falsely, they don't have to vote if they signed the recall petition, among other attempts to depress turnout among Barrett voters using false information. The Walker campaign said in response to the reports that "any accusation that our campaign is making those calls is categorically false and unfounded." CBS News exit polls found that 52 percent of voters in Wisconsin approve of how Walker has handled the issue of collective bargaining, and 54 percent approve of how he has handled job creation. Fifty-two percent said they approved of the recent changes to state law that limits collective bargaining for government workers, while 47 percent disapproved of these changes. Fifty-one percent of Wisconsin voters in the early exit polls said they have a favorable view of unions for government workers -- a group that largely backed the recall -- while 45 percent have an unfavorable opinion of these unions. The exit polls showed Barrett winning handily among union households, while Walker dominated among Tea Party voters. Walker also won by 9 points among independents. The polls showed Walker winning with men and those making more than $50,000, and Barrett winning among women and those making less than $50,000 per year. Walker dominated Barrett in the money race this time around thanks in large part to donors from outside the state. As of campaign filings released on May 29, Walker had raised $30.5 million, with about two-thirds of that total coming from donors outside Wisconsin. Barrett had raised roughly $4 million, with about one-fourth coming from outside the state. Part of the disparity can be explained by the fact that Walker, as a sitting governor facing recall, is not subject to the state's legal limits on campaign contributions under Wisconsin law. Barrett, by contrast, was legally barred from accepting contributions in excess of $10,000 per person. The rest of the spending in the race has been from outside ideological groups. The Tea Party-linked group Americans for Prosperity alone told CBS News it has spent $10 million on the race since January 2011 on what it says is education over the positive impact of Walker's budget reform efforts. The effort to recall Walker effectively began last February. That's when the newly-elected governor, who had defeated Barrett in the 2010 election, released a budget plan that proposed elimination of most public employee bargaining rights. Walker had suggested during his 2010 campaign that he would close the state's $3.6 billion budget shortfall in part through cuts to public employee pensions, but he said nothing about eliminating collective bargaining rights. His announcement galvanized many on the left, who began chanting "Recall Walker" at the Wisconsin statehouse as part of massive protests against the plan. Wisconsin Senate Democrats even temporarily fled the state in an ultimately futile effort to keep Walker's plan from being passed. In January, Walker's opponents submitted more than 900,000 valid signatures to the state to trigger the recall election, far more than the 540,208 needed to do so. Barrett won the Democratic primary last month, beating organized labor's preferred candidate, and went on to promise to "end this civil war" by defeating Walker. 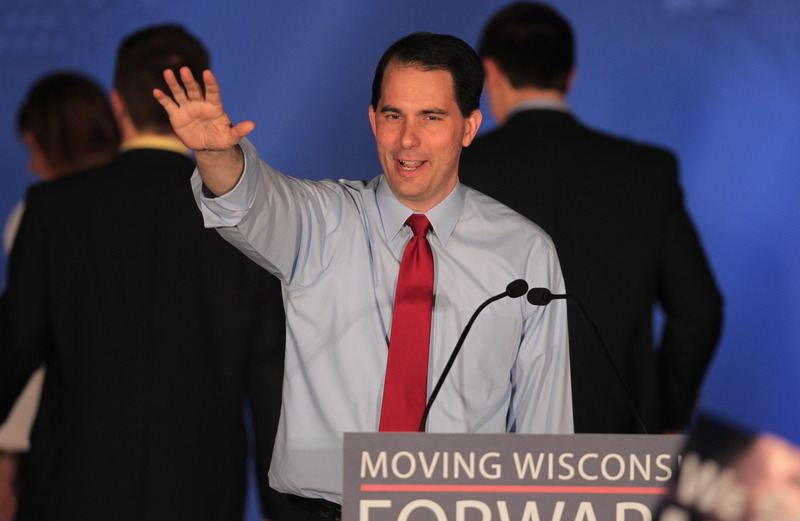 Walker defeated Barrett by nearly six points in the 2010 Wisconsin gubernatorial race. Sixty percent of Wisconsin voters said in CBS News exit pollsthat recall elections are only appropriate for official misconduct. Twenty-seven percent said they think they are suitable for any reason, while 10 percent think they are never appropriate. President Obama expressed support for Barrett but did not campaign in person for him, prompting grumbling from some Wisconsin Democrats and labor leaders. Among those who did was former President Bill Clinton, who said a Walker victory would prompt Republicans around the nation to conclude: "We're finally going to break every union in America. We're going to break every government in America. We're going to stop worrying about the middle class. We don't give a rip whether poor people will get to work their way into it. We've got our way now. We've got it all. Divide and conquer works." Republicans called the race a test of whether they can push through the difficult reforms needed to deal with massive federal, state and local budget deficits. "Governor Walker has shown that citizens and taxpayers can fight back - and prevail - against the runaway government costs imposed by labor bosses," Romney said Tuesday evening. "Tonight voters said 'no' to the tired, liberal ideas of yesterday, and 'yes' to fiscal responsibility and a new direction. I look forward to working with Governor Walker to help build a better, brighter future for all Americans." Mr. Obama won Wisconsin by 14 points in 2008, but the recall fight has Republicans suggesting it may be within reach for Romney. The exit polls found that Mr. Obama led Romney 51 percent to 44 percent among voters in the recall election. Tripp Wellde, State Director of Mr. Obama's re-election campaign in Wisconsin, pointed to that exit poll finding and said that despite the loss, "The power of Wisconsin's progressive, grassroots tradition was clearly on display throughout the run up to this election and we will continue to work together to ensure a brighter future for Wisconsin's middle class." While Republicans held a major advantage on the airwaves thanks to the massive spending by Walker and his backers, Democrats had a big advantage in organization on the ground, thanks in part to a get-out-the-vote effort backed by organized labor. Walker's victory suggests that the newly-legal unlimited spending by super PACs and other outside groups - which was unleashed by a pair of recent Supreme Court decisions, including Citizens United - can overcome the ground game Democrats have steadily built up around the nation in recent years. While a loss may well have effectively ended Walker's political career, his victory will elevate him to superstar status among conservatives and likely prompt talk of a future presidential run. It also feeds the notion that the influence of organized labor - which made the governor's defeat a top priority - continues to wane. Also surviving recall elections on Tuesday were the state's Republican lieutenant governor, Rebecca Kleefisch, and three Republican state senators, according to the Associated Press. In a fourth state Senate recall election, Republicans were leading. If Democrats were able to triumph in any of the state senate elections, they would win a majority in the Wisconsin Senate and be able to block Walker's agenda even though he remains in office.